Published: Feb. 19, 2013 at 12:13 p.m. 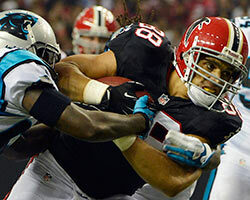 Updated: Feb. 20, 2013 at 08:59 a.m.
On the heels of discussions between Tony Gonzalez and head coach Mike Smith, Atlanta Falcons general manager Thomas Dimitroff recently stated his belief that the odds of the tight end retiring have moved from 95 percent to 50/50. Dimitroff now has reason for further optimism. ESPN's Ed Werder reported Tuesday morning that Gonzalez has begun "wavering" on retirement talk. "I'm told virtually everyone in the Falcons' organization has been campaigning for Gonzalez to make one more Super Bowl run," Werder said. "And I'm told that he's beginning to waver. The people who have spoken to him seem to believe that they're making progress. In fact, one player close to Gonzalez told me 'I think, if the circumstances are right, that Tony Gonzalez will return.' "
It has been our belief all along that Gonzalez will return for one more season, primarily because he's still playing at a ridiculously high level while the Falcons remain in a Super Bowl window. "The fact that he caught over 100 balls this year and a really strong playoff run for us, you know, meant a lot to me," Dimitroff said on the Rich Eisen Podcast Monday. "I still look back to 2009 when Scott (Pioli) and I did the trade with Kansas City, and I really believed that was going to be a one- or two-year trade ... and here we are now talking about a fifth year."